MANCHESTER, England (CNS) — Sherry Anne Weddell recalls the moment when she stepped “across the threshold” and entered a Catholic church for the first time. It was while she was studying at the University of Washington in Seattle and, coming from a Southern Baptist background, she was looking for a Protestant church in which to pray. All those in her vicinity were closed, but Blessed Sacrament Catholic Church was open. “I know it sounds incredible, but I didn’t know what that (the Blessed Sacrament) was, and if you had explained it to me I wouldn’t have believed you,” she said in a May 12 lecture to lay Catholics of the Diocese of Shrewsbury, England. Weddell, who has now published three books on the Catholic Church, told the audience: “I started praying in Catholic churches because, even though I was going to Protestant churches and they were very lovely, I would say, ‘yes, but that thing isn’t here’, the Presence isn’t here. “In fact, I used to get really upset when Catholics messed up my personal prayer places with their Masses,” she joked. Seattle-born Weddell, who had grown up in southern Mississippi, did become a Catholic in 1987, after she prayed for God’s guidance before a statue of St. Catherine of Siena, the 14th-century Italian doctor of the church. She said she learned from this experience that openness to the will of God has the power to change a life in a dramatic and rewarding way. Weddell has traveled a long way since then and is gaining international recognition as something of an authority on the “new evangelization,” the project of the Catholic Church to preach the Gospel anew, particularly in the once Christian nations of the West. Her work began in 1993, when created a “charism discernment process” specifically for Catholics, and it advanced when, four years later, she co-founded the Colorado-based Catherine of Siena Institute with Canadian Dominican Father Michael Sweeney. In a May 12 interview with Catholic News Service at St. Ambrose College, near Manchester, she said the mission of her institute was initially to better equip parishes to form “lay apostles,” people whose faith has matured into a relationship with God and which bears positive fruits. “We got involved in evangelization when we discovered that most of our people weren’t capable of being apostles yet because they weren’t disciples,” she said. So the targets of evangelization in the first instance became church-going Catholics whose faith was cultural rather than intentional, she explained. For many years, most of her work was undertaken at grass-roots level, largely unnoticed by the wider Catholic world, until in 2012 she published “Forming Intentional Disciples: The Path to Knowing and Following Jesus,” a book that has sold more than 100,000 copies and which led to global demand as a speaker. The latter draws on Weddell’s experience of forming thousands of lay Catholics and sets out 23 charisms in seven general categories; it stresses the discernment that must be undertaken before any of them should be exercised. 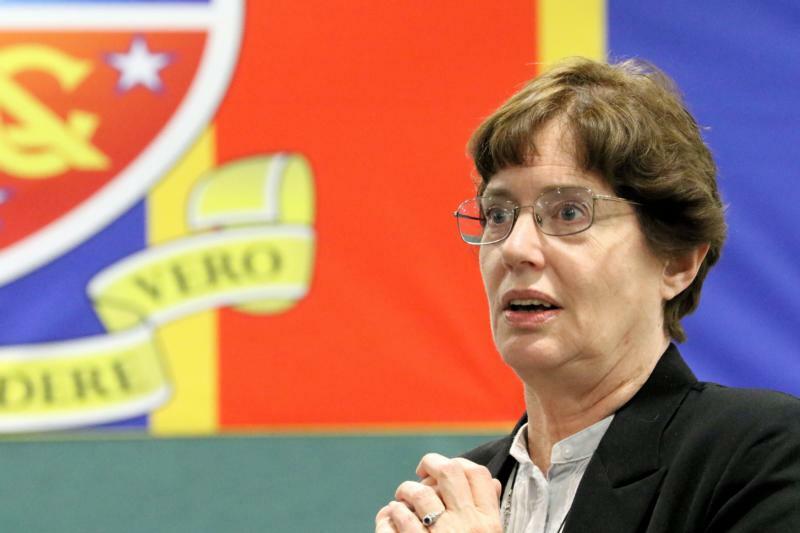 Her work has complemented the call for “missionary parishes” of Pope Francis in “Evangelii Gaudium,” the 2013 apostolic exhortation on the church’s primary mission of evangelization in the modern world. As a woman who speaks “both Catholic and Protestant fluently,” she said she has found that Catholics sometimes do not have the same living personal relationship with God that many Protestant congregations, such as Baptists, prize so greatly. But she is also encouraged because she was seeing “dramatic changes” in the U.S. Catholic Church in particular, and especially in the way it views and speaks of mission, discipleship and making disciples today. “Now, in this culture, people who don’t personally believe will not stay,” she said. “Cultural pressure, familial pressure doesn’t count any more, not with young adults and not with teens coming up. It’s either personally meaningful or they are gone.